Traditional woodwork, exposed beams, and beautiful tiled floors are featured throughout. The house is decorated with many items we have acquired in travels to the Middle East and the Orient, including many kilim rugs and wallhangings. As film is a great love of ours, a number of original movie posters adorn the upstairs. Amenities include a 65 foot swimming pool with teak furniture and a large, adjustable umbrella, meticulously tended gardens, a full modern kitchen and modern, well-appointed bathrooms. All linens are 100% high thread count cotton, and high quality towels and beach towels are provided. The house sits on 4 enclosed acres of terraced olive groves and gardens; there is a locking gate for privacy. It is located just 6 miles from the beaches of Viareggio, 25 miles from Pisa airport, and 25 miles from the walled city of Lucca, with its vestiges of ancient Rome and the Renaissance. The house was restored from the ground up. In its previous life it was a farmhouse; the land nearby was used to grow olives, fruit, and vegetables. 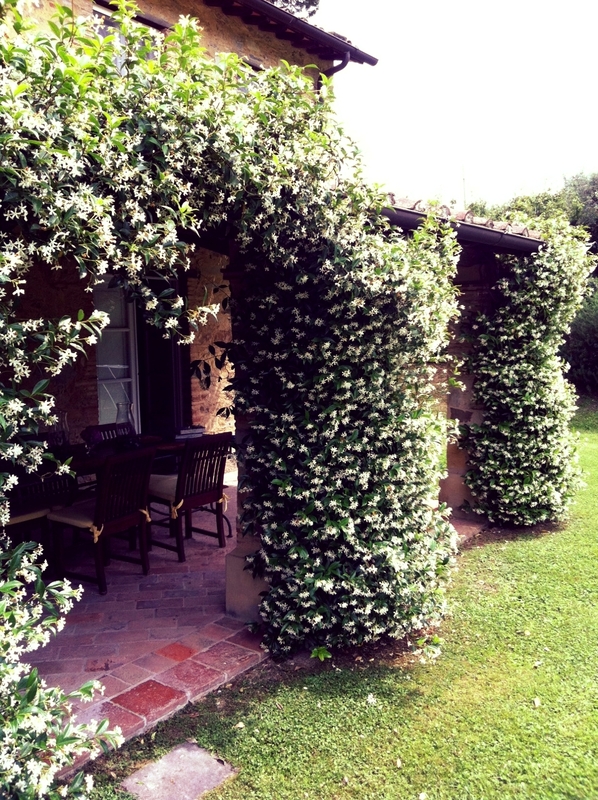 Jasmine blooms on the portico just outside the kitchen facing west. The smell is amazing!